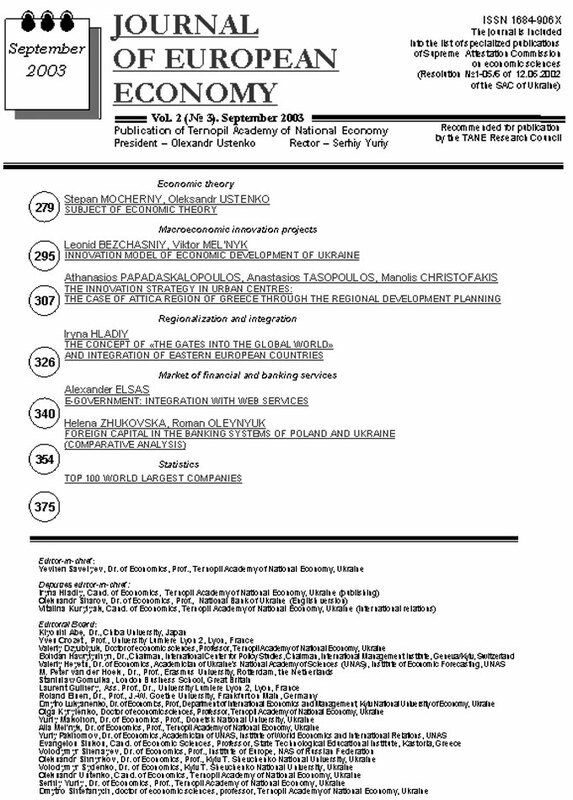 The paper considers conceptual features of international finance as integral attribute for finance expansion and absorbtion of finance within national economy. The author investigates real factors that strengthen international finance, defines the limits of its functioning. Typological features of international finance are defined some of which are related to subsystem of economic basis and to superstructure. Finance, finance of international relations, harmonization of budget policy, internationalfinance, international financial organizations, International MonetaryFund, national budget, taxes, world economy. A flimsy view of historical background of globalization development is covered in the paper. The author denotes new characteristic features of a globalization, and discusses interactions between a globalization and a new economy. adjustment of prices, bank system deregulation, business «take-off», capital flow, capital market, commodity market, conflict between labor and capital, country of well-being, credit market, currency market, digital economy, education, financial crises, financial mediators, globalization, economic growth rate, information and communication technology, industrial revolution, international trade, knowledge-intensive work, knowledge society, labor force, labor market, new economy, new product, new services, population, population migration, three sectors of macroeconomic structure, economic law of one price, unemployment. 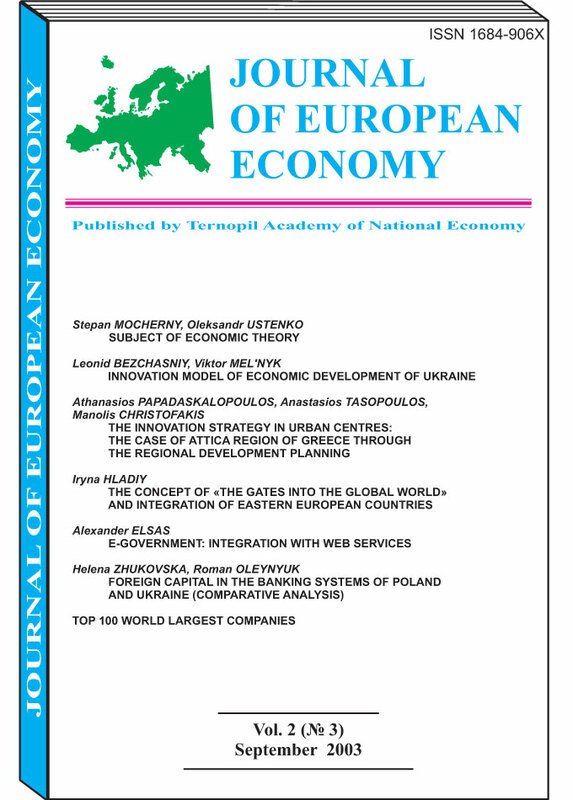 The article discusses theoretical and methodological aspects of overcoming autarky and formulates characteristics of openness of transition economies. As autarky and openness of national economies are at variance with the world economic environment, the ways and methods to overcome this discrepancy are offered. 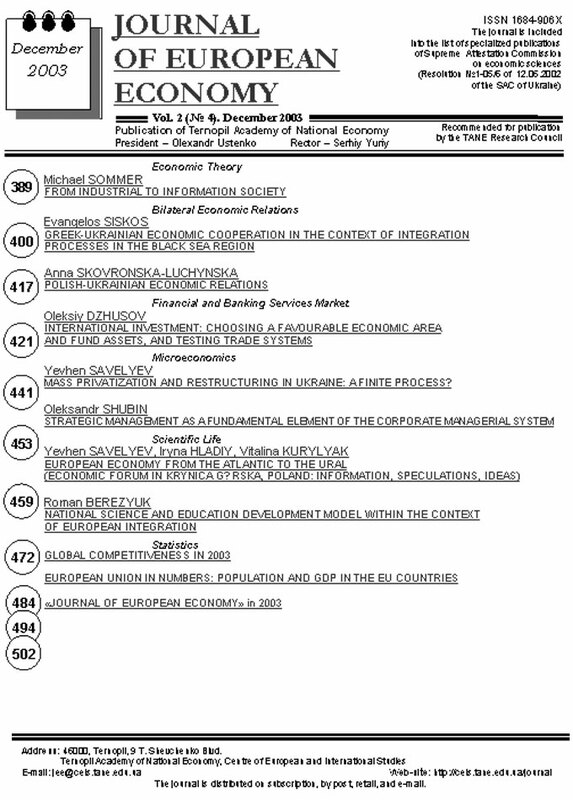 autarky and openness of transition economies; nature and genesis of openness of transition economies; types of openness of transition economies; synergism of appropriation and accumulation that secures the openness of national economies of a transition type; ways and methods that lead to openness of national economies within the world economic environment. How is inequality generated and how it reproduces over time? This has been a major concern of sociology scientists for more than a century. The changes in aggregate or average income is a good measure for economic growth but is far from being the only one. There is an increasing «inequality» throughout the world. Over the period 1960–2000, averaged per-capita income in the richest 5% of the world’s nations was about twenty-nine times the corresponding figure for the poorest 5%. Poverty also affects other forms of economic and social functioning. The measurement of poverty is based on the notion of poverty line which is constructed from monetary estimates of minimum needs. Poverty is highly correlated with the lack of education, and there is close connection between nutrition and poverty. The measurement of inequality is highly controversial. It is a field in which social judgments are highly diverse and translate themselves into differences in social judgments, such as the measure of inequality or the choice of equivalence scale. Social and economic indicators demonstrate the data for the population-based measures of economic, social and health outcomes and answer the question about inequality and wellbeing. This article is an attempt to examine the relationship between inequality and the process of socio-economic development, to overview the theories of income inequality, to measure the income distribution, and moreover, to investigate the role and the effects on socio-economic growth. Absolute poverty, added value, average income, basic needs, Colder’s hypothesis, consumer demand, convergence, earnings, education, endogenesis theory, equality, final poverty line, Gini coefficient, human development, human poverty index, hygiene, income, income distribution, income measurement, inequality, knowledge, level of life, life expectancy, Lorenz curve, medical service, modern technologies, nutrition, nutrition poverty, poverty increase, poverty line, relative poverty, savings, Sollou model, transfers, U-curve, wealth. The future income level is of central importance for a transition economy. Since the level of income is strongly related to aggregate economic activity, the measurement of future activity demands appropriate forecasting model. To construct such model it is necessary to select an indicator of economic activity, as well as a group of variables that, when adjusted, construct the composite (CLI) and diffuse (DLI) leading indicators that forecast the reference series. We develop a model where NBER method is modified with elements of Stock-Watson approach. The model is applied then on a small transition economy (Slovenia). The ex-post analysis suggests that in the period from 1992 to 2001, CLI and DLI forecast all turning points of aggregate economic activity. The average lead-time was 8 years, which is comparable with the performance of leading indicators in other countries. bond, business cycle, composite index, diffuse index, forecast, Granger causality, investor, leading indicator, level of income, price, securities, visible cycle, share, spectral analysis, stock exchange, structural changes, time series, invisible cycle, cause and effect. Measurement procedure of revealed comparative advantages for Ukraine’s economy with the use of two trade classifications, namely Standard International Trade Classification (SITC) and Commodity Classification of Foreign Economic Activity of the Commonwealth of Independent States (TN ZED) is formed. The reporting procedure for the international trade on the basis of 3-digit approach to be applied in Ukraine is proposed, which was not employed before by Ukrainian statistical authorities. The advantage of this reporting procedure over the current one in Ukraine is explained. We calculate the index of revealed comparative advantages (RCA index accordingly for Ukraine’s sectors of economy in international trade with the EU and countries for the year 2001. This index shows that Ukraine has significant comparative advantages on the European market in following commodity divisions: ferrous metals, iron; ores, scoria, cinder; energy and electric power; textile clothing and textile accessory articles; aluminum and aluminum goods; grain, cereals; timber, woodwork and charcoal. Results of conducted research can serve to assess comparative advantages of Ukraine on the European market and determine Ukraine’s prospective exports sectors. 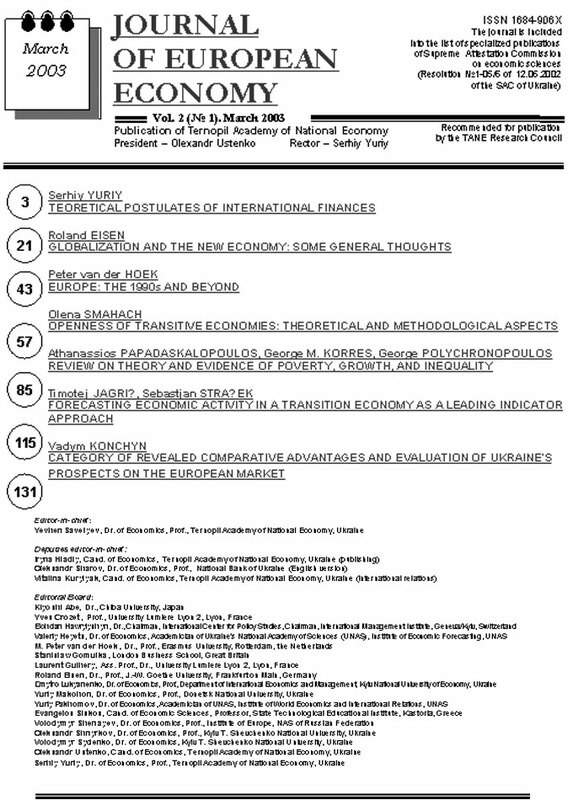 autarky price, commodity classification of foreign economic activity of the Commonwealth of Independent States (TN ZED), commodity divisions (2-digit), commodity groups (3-digit), comparative advantage, Hecksher-Ohlin Theory, labor, new economy, RCA index, revealed comparative advantage (RCA), Standard International Trade Classification (SITC), the new trade theory. The problems of the theory of regional policy which are related to the globalization processes and the European Union enlargement are discussed, the experience of regional development support in Germany and the European Union is characterized, the regional policy in the EU and in the candidate countries is discussed. Preconditions of building up of current regional policy and the policy of support of regions in Ukraine are systematized. Urgent problems in this area are determined, and the ways to meet these challenges in the context of the EU and German experience are shown. The EU experience, policy of regional support, regional policy, regions with poor structures, support of regional development in Germany. On the basis of historical analysis it is shown that globalization has a unique history in the development of life spheres and mankind activities. At the same time, the current stage of the development is characterised by such tendencies in economic sphere that totally change the world economy. In particular, the direct foreign investment growth is greater than that of gross domestic product. The international economic exchange results in an improvement of all countries’ well-being, number of international labour division participants grows, computerisation significantly promotes international exchange reducing transportation costs. History lessons testify that globalization is not a unilateral and not irreversible process. It is more or less politically influenced and thus can be changed to a certain degree. There is made a concussing in the article that the globalization process has to be controlled in such a way that its advantages could be used for compensation to those social groups or countries that turned to become losers as a result of the process. Otherwise national or international conflicts could arise or intensify. Direct foreign investment capital flow, export, foreign trade, globalization, integration, international labour division, international labour migration, international loan, international transportation, liberalization, nationalism, new technologies, noneconomic globalization, oil crisis, protectionism, world economy. The paper studies activity of Trans National Companies as one of globalization manifestations and the TNC’s effect on the world trade. Key approaches to determination of interconnection between globalization and national sovereignty are analyzed. The author substantiates a new approach to creation and stages of globalisation development. Globalization, national sovereignty, new economy, TNC, transnational trade. The gnosiological base of modern monetary theories is revealed on the basis of the maintenance analysis and rational expectations. The author confirms that pracsiologacal conclusions of time inconsistency model have not found wide approval at monetary policy theoretical and fundamental levels. It is proved that the further development of monetary theories depends on optimum institutional mechanisms of trust to the central banks and flexibility of their reactions to macroeconomic shocks maintenance. 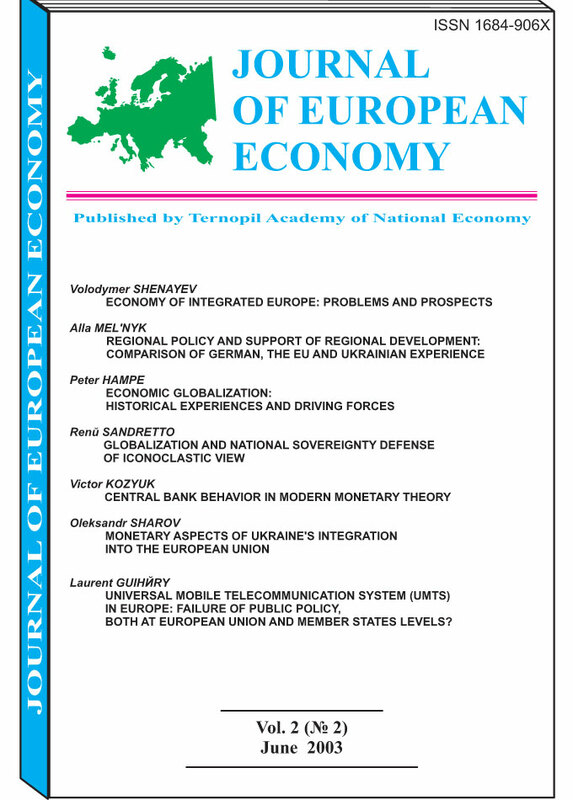 On its basis the adaptibility of models which are methodologicalally connected with a new macroeconomic paradigm to monetary policy institutional and functional requirements is substantiated. Central banks, discrete decision, monetary policy, monetary rule, time inconsistency, transparency. 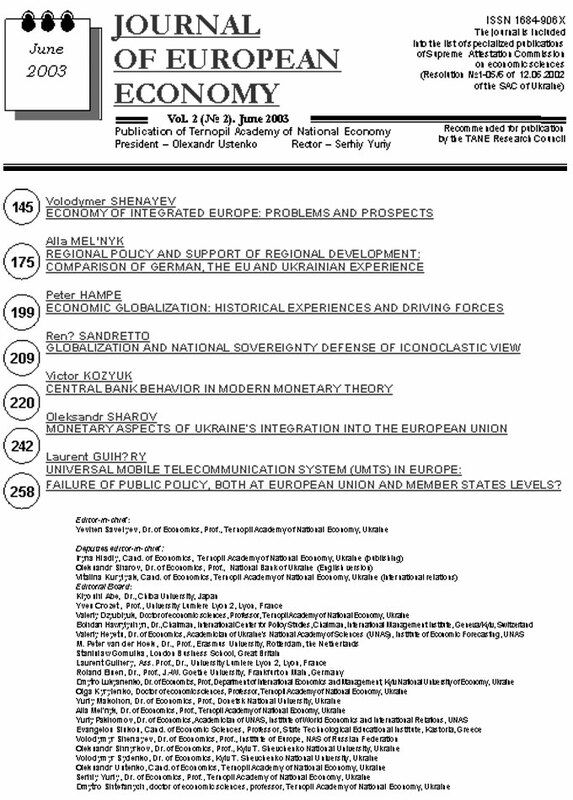 Issues of Ukraine’s integration into the EU finance and banking sector are considered. The author’s suggestions are based on the fact that Ukraine is still on the early stage of integration. Therefore, now we can discuss only the main problems and the variants how to settle them. Meanwhile, they are divided into: a) the problems of central banks immediately arousing because of entering the EU (in most cases these are procedure requirements), and b) the problems related to improvement of national finance and banking system, its adjustment to that of West European. The latter ones are of crucial importance, therefore the government of Ukraine should settle them notwithstanding the plans and schedules of the EU enlargement, since it is a prerequisite for the national needs of Ukraine’s economy. Banks with foreign capital, common currency, Economic and Monetary Union, Euro-integration of Ukraine, European Central Bank, European Union, National Bank of Ukraine. Universal mobile telecommunication system (UMTS) in Europe: failure of public policy, both at European Union and member states levels? Various aspects of modern crisis are considered and attempts to estimate development expediency of the second and third mobile Internet generations of the European telecommunication market are undertaken. 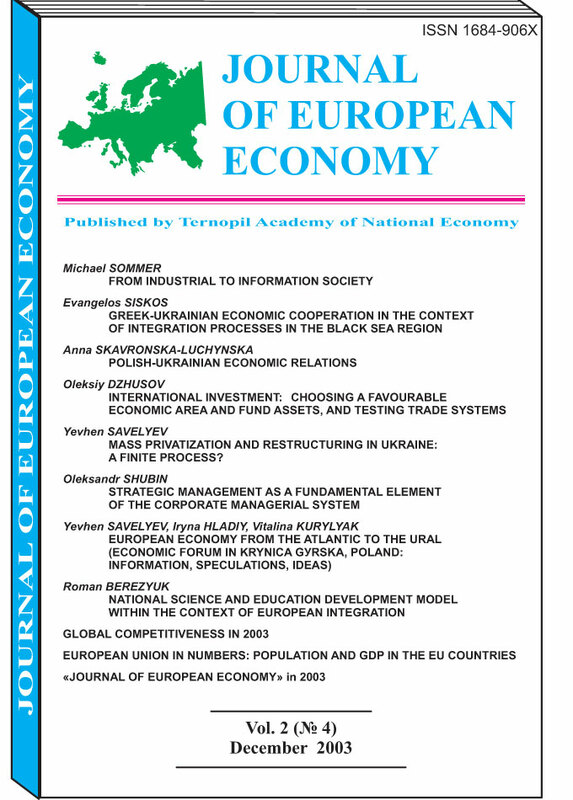 In details there are investigated problems of the Third Generation of Mobile Internet (UMTS) network management, in particular of medium-term Internet strategies, reasons of the European telecommunication crisis, features of the UMTS network investment, influences on other industrial branches, and characteristics of standards’ selection and license cost. Crisis, debt, financial markets, high technology, infrastructure, investments, licenses, management, mobile connection operators, mobile Internet, network, new standard, services. The definition of the economic theory subject is still under discussion. In order to do it, the authors find it appropriate to use the methodology of the shortest, most detailed, and complete definition of the science subject. 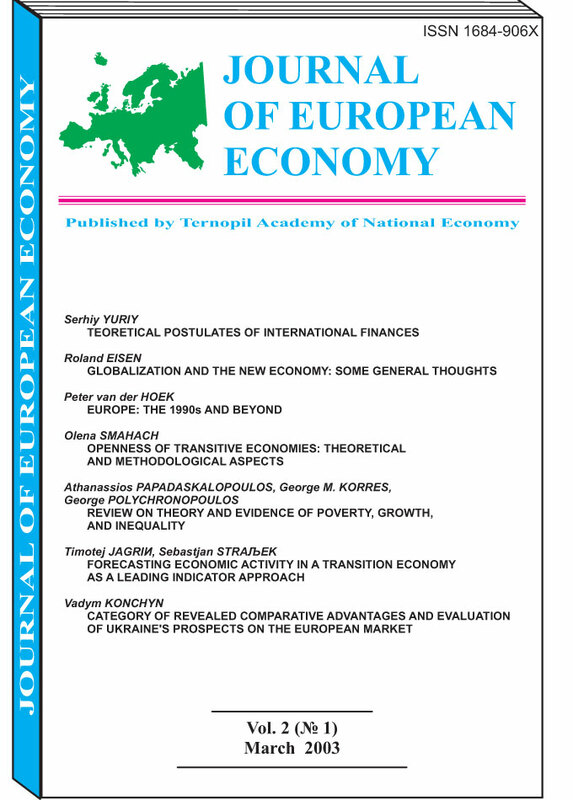 This approach allows to evaluate the structure of economic theory in a new way, in particular, its relations to political economy and economics as well as correlation between the latter two sciences. Economic and productive relations, human behaviour and activity, scarcity of resources, methodological base, positive and negative aspects, profit maximisation, revenues and costs, subject of economic theory. Conditions for implementation of objective laws of innovative economic growth in Ukraine are determined. Competitive advantages, economic growth, innovations, investments, macro- and micro-economic policy, national economy, structural and technological transformation of economy.